A trial that has been awaited by many for years — and focuses on possible discrimination claims filed against the University of Iowa Athletics Department — opened Monday in Des Moines. Kevin Ward, vice president of Human Resources at the University of Iowa, took the stand Tuesday and Wednesday morning and Jane Meyer, who filed the lawsuit, took the stand Wednesday afternoon.Iowa Director of Athletics Gary Barta is expected to take the stand Thursday. Jane Meyer v. University of Iowa could last up to three weeks with more than 40 witnesses being named. A lawsuit was filed by Meyer in November 2015 in response to her reassignment from the UI Athletics Department. 1973-Aug. 2000: The UI had separate men’s and women’s athletic departments. Aug. 2000: Dr. Christine Grant retires from her position as women’s athletic director at the UI. 2000: The men’s and women’s athletic departments merge. Cost savings from the merger were to be used to expand women’s opportunities. The Merger Memorandum was created, which made gender equity a top priority. It recommended that a male and female would occupy the top two positions within the department, regardless of who held the first and second. 2000: Bob Bowlsby is appointed as the UI athletic director. 2000: Tracey Griesbaum becomes the UI’s head field hockey coach. March 2001: Jane Meyer is hired as the senior associate athletic director, which was the No. 2 position in the athletic department at that time. Aug. 1, 2006: Gary Barta is hired as the UI athletic director. Dec. 2007: Women’s volleyball coach Cindy Fredrick is fired. June 2010: Softball coach Gayle Blevins retires. June 2011: Women’s golf coach Kelly Crawford is fired. 2011~2012: Meyer notifies Sue Buckley, UI vice president for human resources, about her relationship with Griesbaum. Meyer is told that, while she has a higher position than Griesbaum within the athletics department, because she isn’t her direct supervisor their relationship does not qualify as a conflict of interest. Meyer notifies the UI of the relationship and gets it cleared by the UI. May 2012: Rowing coach Mandi Kowal is fired. Jan. 2014: Volleyball coach Sharon Dingman is removed after her contract is not renewed. May 2014: Gary Barta announces the creation of the deputy director of athletics position, and says that it will begin that summer. This position will be the new No. 2 position within the department. Meyer, who oversees all athletics facilities and operations and serves as the top administrator for all women’s sports at Iowa, is told she will not be considered for the post. Meyer’s salary is $173,154. May 7, 2014: Barta receives reports of concern about the field hockey program, including allegations of harassment and a prohibited relationship between Griesbaum and an athletics administrator. May 19, 2014: Barta requests an independent review of the field hockey program from the University HR and the Office of Equal Opportunity and Diversity. July 2014: It is announced that Gene Taylor, intercollegiate athletics administrator at North Dakota State University, will be assuming the new position of deputy director of athletics at the UI. He starts at the UI earning $75,600 more than the maximum amount his job classification allows for, with a salary of $245,000 a year. He is promised a raise of $15,000 after his first year at the UI, which will bring his salary up to $260,000. This also increases the pay differential between him and Meyer to over $83,000 (Meyer’s salary was $173,154). Taylor’s contract has him starting at the UI on Aug. 4, 2014. His hiring puts men in both the No. 1 and 2 positions within the department, which is in violation of the 2000 Merger Memorandum’s recommendation. Aug. 1, 2014: Joseph Bathke, director of University employee and labor relations, and Tiffini Stevenson Earl, compliance specialist and ADA coordinator, complete their investigation into the accusations about Griesbaum’s treatment of her players. The investigation concluded that, while there was no policy violation, it was ‘concerning’ that several student athletes consistently reported an environment of fear and intimidation was created by Griesbaum, and that they felt pressured to play while injured. Aug. 5, 2014: It comes out that Griesbaum was fired after former players made allegations that Griesbaum verbally harassed them, bullied them, and pressured them to compete while injured. Other current and former student-athletes of Griesbaum’s dispute these allegations. Sept. 30, 2014: Griesbaum’s lawyer, Tom Newkirk, publicly states that she may bring a lawsuit against the UI athletics department for wrongful termination if nothing is done. Oct. 30, 2014: Griesbaum and Meyer publicly disclose their relationship. Nov. 16, 2014: Elizabeth Altmaier, an UI psychology professor, says that parents of student athletes reported that their daughters kept silent about Griesbaum’s behavior for fear of retaliation by her partner, Meyer, who was still serving as senior associate athletics director. Altmaier, who was a faculty adviser to athletics between 2001 and 2011, says there should have been a plan developed in order to avoid the appearance of Meyer showing favoritism for Griesbaum, her athletes, and their facilities. Dec. 4, 2014: Meyer files a written complaint with Barta about the actions she has witnessed against herself, female coaches and other females. Dec. 5, 2014: Barta puts Meyer on administrative leave and moves her out of the athletics department. In an email to coaches, Barta says that this was done in response to the possibility of Griesbaum filing a wrongful-termination lawsuit. 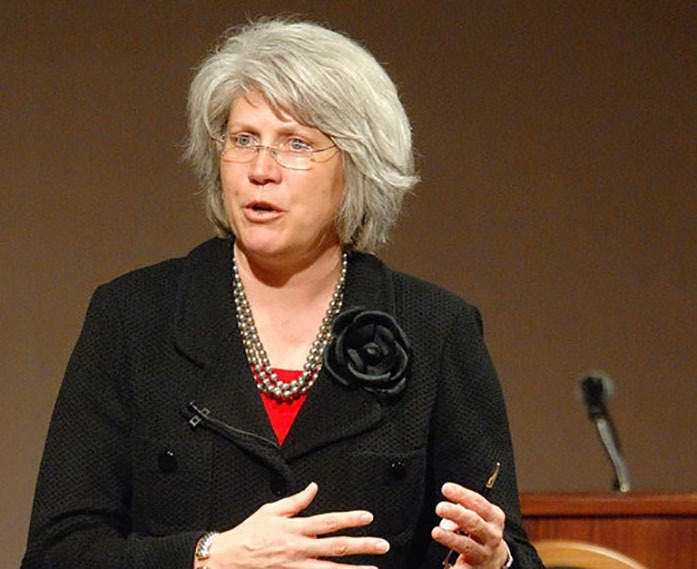 April 2015: Meyer is reassigned to the UI’s College of Liberal Arts and Sciences as project manager and logistical strategist. According to an official statement given by Jeneane Beck, assistant vice president for external relations, Meyer’s duties involve overseeing and coordinating the move into and equipping of the new Voxman Music Building and the Studio Arts Division in the new Visual Arts Building. The statement also says that while these flood recovery projects were initially supposed to end in June 2016, they are now expected to be completed near the start of the 2016 fall semester. July 2015: Griesbaum files a civil rights complaint with the state of Iowa over her termination from the UI. Nov. 4, 2015: In Polk County court Meyer files a lawsuit against the UI, the Iowa Board of Regents, and the state of Iowa. The lawsuit argues that her reassignment was unfair and an act of retaliation for speaking up about gender inequality. She argues in the lawsuit that she experienced discrimination on wages due to her gender and sexual orientation. According to her lawsuit, these claims were not investigated when she reported them to the University of Iowa Human Resources, UI Office of Equal Opportunity and Diversity, and the Regents. According to Meyer’s lawsuit, Meyer received her first poor performance evaluation in 13 years from the UI after speaking out about gender inequality and confronting Barta about discrimination within the athletics department. Nov. 6, 2015: Meyer says that she had been bringing instances of gender discrimination to Barta’s attention for years. Jan. 1, 2016: An extension to Barta’s contract with the UI goes into effect. The contract, which would’ve expired after June 30, 2016, was extended to June 30, 2021. March 7, 2016: Griesbaum files a lawsuit against the UI, Board of Regents, and the state of Iowa over her termination, claiming that Barta treats female coaches unfairly. The lawsuit also claims that the UI athletics department “began a pattern of undermining, intimidating, and terminating coaches as well as covering up violations of the law to keep resources from women’s programs,” in 2006 following Barta’s appointment as athletics director. The lawsuit alleges that Barta has forced seven other women out of the department, among them Meyer. June 9, 2016: Meyer receives a three-month notice of termination letter from the UI telling her that her position will be eliminated and she will no longer be employed there effective Sept. 9, 2016. This is because, according to an official statement given by Beck, that is when the flood recovery projects in which Meyer is involved are expected to end. July 13, 2016: Meyer’s attorney, Jill Zwagerman, goes to court seeking an injunction which will block Meyer’s termination from taking effect. Aug. 26, 2016: Polk Country Judge Michael Huppert denies Meyer’s injunction request to prevent her termination from the UI from taking effect. Sept. 9, 2016: Meyer’s last day working for the UI in any capacity.